Meet the water vole-woman from Shropshire, the owl ambassador from Somerset and Gordon, the dancing toad man. These and many other fabulously engaging characters carry a deep knowledge of their chosen species within a distinctly quirky shell. 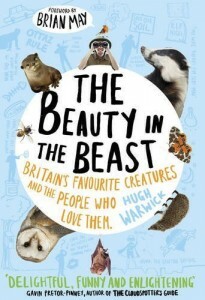 The Beauty in the Beast is Hugh Warwick’s second offering of natural history; his first book delved into his own passion, the hedgehog. This time, he’s discovering other people with as great a passion for British wildlife as his own and the species they love. I don’t often read non-fiction but when I do, I enjoy nature writing as it’s a chance to disappear into another world, except this time, it’s one that I could visit myself, so I began reading The Beauty in the Beast with great expectation as to what I might find out about British wildlife and the people who champion it. The review copy we received from Simon & Schuster is a hardback and I really love the dust-jacket illustration. Personally, I really prefer it to the paperback cover but that shouldn’t put anyone off. The book begins with an introduction from Warwick, explaining that he’s looking for another animal worthy of a tattoo to match his first, a hedgehog, and this gave me the opportunity to ‘tune in’ to his narrative style. The book is written in the first person, as Warwick narrates his adventures and encounters with fifteen enthusiasts and, when lucky, the creatures themselves. The tone is friendly and affable, if a little male and un-PC at times, and always clear enough for people with no prior knowledge of the academic study of biology or natural history to be able to follow the ideas being discussed. There is some use of scientific language at times – as there should be in this kind of book – but any complication or specialist terms are always in context and explained if needed. Warwick keeps an open mind about the possible companion to his hedgehog tattoo and his quest is divided into fifteen chapters, as he travels to all the corners of the British Isles to meet his contacts. The candidates range from the everyday – House Sparrows, Robins, Bees and Moths – to familiar woodland names – Foxes, Badgers, Bats and Owls – into the more rare and illusive – Water Voles, Otters, Beavers and Dolphins – and into territory that some might regard as ‘creepy-crawly’ – Dragonflies, Toads and Adders! I think this is a real insight from Warwick because, while ultimately only one creatures intrigues him enough to be worthy of tattoo number two, it does illustrate that there’s huge interest, excitement, amazement and joy to be found in the most apparently ordinary or unprepossessing animals. He twice mentions a phrase coined by Stephen Jay Gould – “we will not fight to save what we do not love” – which would consign quite a few species to the dustbin of life if we’re not careful. Warwick clearly finds some of the species, and some of his journeys, more engaging than others and it’s clear in his prose when he feels frustrated at the lack of a meeting with a creature. For example, he finds the initially identical moth specimens hidden away in a warehouse in Edinburgh fascinating on closer inspection but he’s obviously disappointed not to see some beautiful live examples when he and his guide, Amy, go on a nocturnal stake-out in the nearby countryside – it was simply too cold for the moths to come out on that occasion. This could be off-putting if handled wrongly but instead serves to illustrate Warwick’s keenness to be impressed, even converted, to a love of the species in question. In contrast, his joy is infectious when he’s able to ‘meet’ a creature in person – the brown long-eared bat, a brush with an owl, a contented beaver and some very close encounters with sunbathing adders in Norfolk. Really, I think The Beauty in the Beast is a subtle attempt at converting us. Warwick would like everyone to have a passion for wildlife, be that one species in particular like he and his fellow advocates, or for Nature in the wider sense – a walk in the woods, a trip to the beach, or putting a feeder on your windowsill and seeing what comes to visit. I, perhaps, would have liked a little more detail about each of the animals, but really this is a story of love for wildness and a piece of positive propaganda for not just looking, but seeing, what’s around us, appreciating it and maybe even trying to preserve it before it disappears, just like the nature-mad animal-champions in each chapter.